Back in the very early 1990s, I was working on a contract basis for a company that made telecommunications equipment. My schedule was pretty flexible. In fact I was able to set my own schedule, and I took full advantage of that fact. Payday was every two weeks, and I usually started a new pay period by working twelve and fourteen hour days to get my 80 hours in the first week so I could take the second week off. Sometimes I would even work 160 hours in two weeks so I could take the following two weeks off. This gave me lots of time off for camping, caving and budget road trips. It is worth mentioning that I was also single during that time, so I didn't have to worry about relationship difficulties arising out of my frequent absences. On one of these instances where I had just finished my work and had a week or more off, there wasn't much going on. It was probably January or February; the holidays were over and the Spring activities hadn't started yet. It was raining, had been for a couple of days and showed no signs of abating. The temperature was barely high enough to prevent the rain turning into snow. All in all, miserable weather. I was already getting cabin fever. For lack of anything better to do, I inventoried the contents of my survival kit. I don't think the term "bugout bag" was popular yet, but that's basically what it was: a medium sized fanny pack with a few survival items in it. Stainless steel cup, aluminum foil, Ramen noodles and a couple other food items, fire starting materials, space blanket, stuff like that. As I perused the contents of my bag, a plan started to formulate. It seemed like the kind of weather I would find myself in during a wilderness survival situation. How would I sleep, without a sleeping bag? How would I get and stay dry, so as to not succumb to the elements? 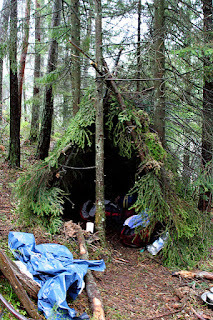 I had to do it; test my survival bag contents and my own ability to spend a night in the soggy woods, in winter, without my normal backpacking equipment. So I put on my boots, coat and hat, grabbed my survival kit and headed out the back door. I was living in an apartment on the edge of town. There was a small patch of woods behind my apartment, and a railroad track ran through those woods. It was near the end of that line; the tracks stopped less than 5 miles away at the Tennessee River. I got on the tracks and walked in the direction of the river. When I was almost to the river and there were no more roads, I got off the tracks and headed further into the woods. By the time it started getting dark I was thoroughly soaked. I couldn't have been any wetter if I had jumped in the river. It was time to stop for the night. I had found a small, battered piece of roofing sheet metal a ways back and brought it along. I put it down at the base of a small tree and looked around for some rocks and whatever else I could find, and ended up building a simple wickiup against the tree. It looked similar to the photo above, with the addition of a rudimentary fireplace that I built by digging a small hole and piling rocks around it. I used the sheet metal as part of the wall and to reflect the heat of the fire. I used to buy these fire starter logs that are 3 or 4 inches in diameter and maybe 10 inches long, made of wax and sawdust. I would cut about a 2 inch slice of that, put it in a ziplock bag and stuff it in my pack. Whenever I needed to start a fire I would just pinch off a small chunk of it and use it as tinder. It works well; it's pretty water resistant and even a small lump burns for several minutes. I had a slice of that in my survival kit, and used some of it to start a fire. By the time it was full dark, my fire was going well and I was enjoying a hot cup of ramen noodles and watching the steam rise off my clothing. After awhile I was fully dry and warm. A funny thing happened during the night, though: a skunk discovered my little haven and wanted to share it with me! Now, I've been around skunks enough to not fear them. In fact, they are amazingly funny and amiable creatures. But I didn't want to share my little shelter with one. If I happened to roll over on it in the middle of the night, it might not end well. So I spent an hour or two driving it away with my fire poker, every time it tried to worm its way in. Other than that little incident, I had a reasonably good night. It stopped raining sometime during the night, so the trip back home was not bad at all. OK, obviously this is two different days. Here I have a 208/220V; 440V, 5 horsepower 3-phase motor that I am experimenting with converting to an inductive generator, powered by my Changfa S195 Chinese 12 hp diesel engine. I'm learning here; I have never done this before. In both clips, the motor is wired for low (208/220) voltage. That means it is wired Wye-Wye (two sets of windings paralleled), whereas it would need to be wired Wye (both sets in series) for 440V. Does this mean I could produce 440 volts with this setup? Undoubtedly. Rectify that to DC and power the plate circuit of a tube linear amplifier without the big transformer normally required. Add a small transformer for the low voltage stuff, and this would make a good power supply for a legal-limit ham radio station. So anyway, in the first clip I am using only one capacitor, and it is the only capacitor I could find in the microFarad range that was rated for high voltage AC. It has nowhere near enough capacitance; I think it was 0.75 uF or something like that. As you can see, it didn't work. Digging around in cyberspace, I found reference to C-2C wiring for this specific purpose. Unfortunately the guy who was describing it didn't have a firm grasp of what he was describing, having simply followed someone else's directions. Thus, although it would seem that "2C" would imply double the capacitance of "C", the narrative did not leave me with a feeling of confidence that that was what he meant. Not disrespecting the guy or anything, just telling it like it is. So I searched further and ascertained that, indeed, 2C means 2C and not merely C2. I found other stuff about it too, which gave me the confidence to actually spend a bit of money. Basically, it works like this: imagine a delta-wound, 3-phase motor. There are of course 3 legs to which the power connects; L1, L2 and L3. L1 and L2 will be the output. C, the first capacitor, connects in parallel across L1-L2. 2C connects in parallel across L2-L3. Nothing connects across L3-L1. 2C can be either a single capacitor of double the value of C or, as you see here, two caps of the same value as C, connected in parallel. So I went to everybody's least favorite online auction site and bought three identical, new, 55 uF 440V motor run capacitors. As you can see, this works; at least as far as producing voltage. Stay tuned, because next I plan to load it with some heating elements to see what it can do. This is an old (ca. 1966) US Army training film describing how to operate the M16/AR15, and a functional description of same. AR-15 books and accessories, click here.